ARLINGTON, TEXAS (October 24, 2011) The finalists for the World Tenpin Bowling Association World Bowling Tour Finals presented by the Professional Bowlers Association were determined Oct. 22 after the conclusion of the AMF Australian Masters - the final event on the 2011 World Bowling Tour. The top three players in the final World Bowling Tour points list in both the men's and women's divisions advanced to the World Bowling Tour Finals, which will take place Nov. 17 in Las Vegas with a total prize fund of $40,000. Finland's Mika Koivuniemi took the top spot in the men's rankings with 198 points, while the United States' Sean Rash was second with 142 points. Jason Belmonte of Australia finished third with 120 points. On the women's side, the United States' Carolyn Dorin-Ballard finished first with 145 ranking points. A pair of Swedes were next with Nina Flack in second at 120 and Sandra Andersson third with 111 points. The World Bowling Tour is made up of various events around the world throughout the course of 2011. Players earn points based on how they finish in the event and those points were tabulated throughout the season to determine the top three men and top three women who will be invited to compete in the World Bowling Tour Finals presented by the Professional Bowlers Association. The World Bowling Tour Finals are scheduled to take place at the PBA's World Series of Bowling on Nov. 17. The event will be aired nationally in the United States. The top three men and top three women will bowl a stepladder finals format in their respective divisions at the World Bowling Tour Finals. The prize money for each division is the same, with the winner taking $10,000, second place earning $6,000 and third place winning $4,000. The World Tenpin Bowling Association, which is made up of 115 bowling federations, governs the sport throughout the world. For more information on WTBA and the World Bowling Tour, visit WorldTenpinBowling.com. HOUSTON, TEXAS (October 23, 2011) Today, the Houston Texans will face off against their AFC rivals, the Tennessee Titans with a 12 p.m. CT kickoff in Nashville. The last time the Texans faced the Titans, Houston trailed 24-3 at halftime and never caught up in a 31-17 loss on Dec. 19, 2010 at LP Field in Nashville. Texans quarterback Matt Schaub was 35-of-54 for 325 yards, but the Titans out-rushed the Texans 147-30. Titans running back Chris Johnson had 130 rushing yards, while Tennessee held RB Arian Foster to a season-low 15 yards on 11 carries. The Titans led the entire way after scoring on the game’s opening possession. Quarterback Kerry Collins threw a 3-yard touchdown pass to Nate Washington two plays after throwing a 39-yard pass to Damian Williams on 4th-and-8 from the 42-yard line. The Texans turned the ball over on their first possession after Foster was stuffed for a four-yard loss on 4th-and-1 from the 35. On the next play, Titans wide receiver Kenny Britt turned a near-interception into a 52-yard gain to the 2-yard line. Cornerback Glover Quin was primed to pick off Collins’ pass before safety Troy Nolan tipped it and the ball bounced right to Britt. Four plays later, Collins threw a one-yard touchdown pass to wide receiver Justin Gage on 4th-and-goal. After a 23-yard punt by Matt Turk, the Titans only had to go 44 yards to make it 21-0 with an 11-yard run by Chris Johnson. The Texans got on the scoreboard with a 37-yard field goal by Neil Rackers late in the second quarter. The Titans answered with a 30-yard field goal from Rob Bironas on the last play of the first half. On the first series of the third quarter, wide receiver Andre Johnson got the Texans within 24-10 with the 50th touchdown catch of his career on a 12-yard pass from Schaub. The Titans went up 31-10 with a seven-yard touchdown run by Javon Ringer near the end of the third quarter. With 6:28 left in the game, the Texans made it 31-17 after a four-yard touchdown pass from Schaub to Kevin Walter. Houston Cougars Thump Marshall 63-28: Where Do They Go from Here? HOUSTON, TEXAS (October 22, 2011) What can one say after a football game that ends in a 35-point win for the home team and raises the team’s season record to 7-0? Some may think that the score says it all and that nothing more needs to be said. If the world was so simple that above statement would simply be enough. More precisely, if the game of college football was so simple it might make for an easier time of understand the game as a whole. But college football is not that simple. One must indeed look at what else happened in the game. 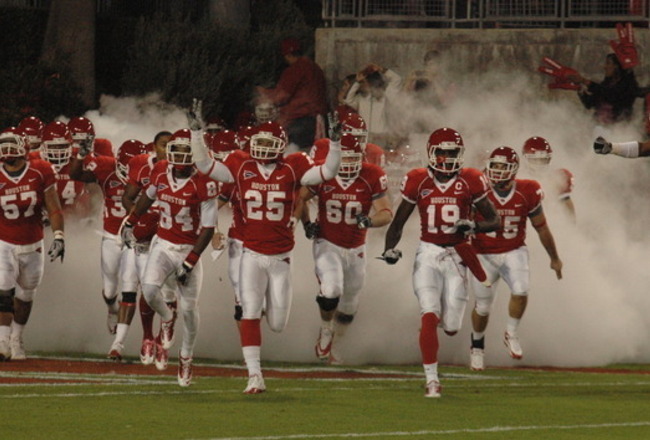 Yes, the Houston Cougars are now 7-0 after their 63-28 thumping of the Thundering Herd of Marshall. Marshall came into Robertson Stadium sporting a 2-1 Conference USA record and leading the East Division of the conference. The Thundering Herd controlled the ball for 42 minutes of the game. That means the Cougars’ defense was on the field for nearly 3/4 of the game. No matter what one thinks about the Houston defense, that fact definitely had an impact on the game. Add that to the realization that Houston has been struggling with their defense all season makes for a dangerous situation if their opponents offense ever gets on the move. Houston gave up 506 total yards to Marshall. That is way too much. Holding them to 28 points was a factor in the game, but the fact is Marshall failed to capitalize on their offensive drives and Houston scored easily when they did have possession of the ball. Case Keenum had a very successful day. He competed 24 of 28 passes for 376 yards and six touchdowns. That performance did enable him to become the NCAA's career total offense record holder. If he keeps this up, he should have no problem breaking both the NCAA all-time passing yardage record and the NCAA all time touchdown passes record. sport a 2-5 record and should be no match for the Cougars. But the way college football is, nothing is guaranteed. Houston head coach Kevin Sumlin needs to evaluate the defensive performance from today’s game and continue to tweak and refine where the defense is going. To his credit, the Houston defense has shown improvement this year and is steps above when it was this time last year. However, if he hopes to build on what has dome so far and continue to see improvement, he must expect…no, he must demand that the defense step up and do a better job than it did against Marshall. After all, he has at least five games to go in 2011 and possibly two more if he gets to the C-USA championship game and the eventual bowl game that may come at the season’s end. Add that to all the speculation of a possible move to the Big East Conference and all that implies makes the defensive situation crucial. After all, this is college football and anything can happen. HOUSTON, TEXAS (August 30, 2011) With the fall season less than two weeks away, the University of Houston golf team recently returned from a weekend retreat designed to inspire and energize the student-athletes. Head coach Jonathan Diskmuke, assistant coach Chris Hill and the 2011-12 Cougar team recently took part in a retreat in The Woodlands. During that time, members of the team went through team-building activities and set goals for the upcoming campaign. For Dismuke, getting away from the campus and the Athletics Department for a few days is a great way for the student-athletes to focus a little more and get to know each other better. One of the highlights for all team members was listening to a pair of Navy SEALs. On Friday night, the team listened to an active duty SEAL member, who cut an impressive figure in his white uniform bedecked with rows of ribbons. That SEAL member, who could not be identified by name or in photographs due to his current status, shared his story of overcoming poverty to become a leader in one of the military’s most prestigious and lethal units. SEAL Commander Mark McGinnis spoke to the Cougars on Friday night and Saturday morning. As a leader of more than 400 successful missions during his military career, McGinnis emphasized the importance of brotherhood among team members, attention to detail, organization and building a championship culture to the Cougars. With an engaging style and endless military stories, McGinnis held the Cougars’ attention for hours each day. The Cougars open the 2011 fall season when they compete at the Gopher Invitational on Sept. 11-12 at Spring Hill Golf Club in Wayzata, Minn.
HOUSTON, TEXAS (October 21, 2011) The University of Houston swimming and diving team fell to the University of Miami 136.5-103.5 Friday evening at the Campus Recreation & Wellness Center. The Cougars turned in four first place finishes and two NCAA “B” cut times in the losing effort. The loss was the first on the season for the Cougars and the first under head coach Augie Busch. Houston was on the road last weekend and went 3-0 in Boston against Boston University, Northeastern and Boston College. Heather Winn took first (10:18.56) in the 1,000 yard free to lead a strong showing by Houston as they finished 1,3,4 and 5 in the event. It was Winn’s third win of the year in the event. Winn also registered an NCAA “B” cut time in the 500 yard free when she touched the wall in 5:03.98B to finish as runner up. Reka Kovacs placed first in the 200 yard IM and notched another NCAA “B” cut time in 2:07.47. The junior delivered a strong back half of the event to overtake first place for her second 200 IM and third IM win on the season. Junior Julia Lonnegren scored 13 points for Houston as she took first in the 1M and runner up in the 3M during the diving portion of the evening. Lonnegren dropped her first event of the year by less than five points. The Cougars capped the evening off with a victory in the 400 free relay as Moira Fraser, Kim Eeson, Colleen Donovan and Maddie Clark teamed up to finish in 3:34.68. Eeson turned in the fastest split of the squad (52.42) and finished as the runner up in the 100 and 200 yard freestyle. Frasier and Clark were on the second place 200-yard medley relay along with Beccy Hillis and Heather Coutts to open the meet. The Cougars return to the water next weekend at Rice University for the Holiday Inn Hotel & Suites Med Center Invitational. Houston will face Arkansas, Boise State, Nebraska and Rice on the two-day event. HOUSTON, TEXAS (October 21, 2011) With about 1.5 hours until kickoff of the Houston Cougars and the Marshall Thundering Herd, I can be found sitting in the press box at Robertson Stadium enjoying a plate of nachos and drink a Diet Coke. Having all my pre-game coverage completed, it also gives me time to put my fingers on the keys of this old laptop and to expound on some observations I made while walking to the stadium from the satellite lot where I parked my old Chevy truck. This weekend is homecoming. The air is full of the atmosphere of any typical football, except it multiplied to the Nth degree. There is more bar-be-cue, beer and red and white that this place has seen in a long time. Yes, it is like that at any Cougars game, but this is homecoming weekend. Alumni come from all over to visit the campus and see the spectacle that this game has become. The Cougars are 6-0. The last time they had won their first six games without a loss was 1990. Quarterback Case Keenum is on track to break two more records this season. He needs 130 yards to pass Hawai’i’s Timmy Chang on the NCAA FBS All-Time Total Offense list. Unless the ground opens up and swallows the entire Cougar offensive squad, that record will be broken today. He also needs three touchdown passes to pass Texas Tech’s Graham Harrell on the NCAA FBS All-Time Touchdown Passes list. Harrell currently holds the record with 134 TD passes. That record could also go down today. In fact, I would be willing to bet the rent money that it does. But setting all that aside, The Rob is the place to be in Houston this weekend. Talk is all round about the idea of Houston leaving Conference USA and joining the Big East Conference. Other talk is going around about the Mountain West Conference and Conference USA combining in football for a “super” 32-team conference. If any of those proposals, rumors, and scuttlebutt becomes reality, there will be time to discuss the pros and cons of them later. Today is about the Houston Cougars football team winning a game. Today is about homecoming. Today is about Case Keenum breaking two NCAA records. Hosuton Cougars Football. There is nothing like it in Houston on October 21, 2011. HOUSTON, TEXAS (October 22, 2011) Texas A&M will be seeking its third straight win, including its second straight on the road when the Aggies take on unranked Iowa State in a 2:36 contest on Saturday at Jack Trice Stadium in Ames, Iowa. The Aggies are coming off wins over Texas Tech in Lubbock and Baylor last Saturday in College Station as they gear up for the challenge from the Cyclones. After sweeping its non-conference games, ISU has opened Big 12 play with losses to Texas, Baylor and Missouri. With ISU as a tradition Big 12 North foe, the two teams have played just 10 games previously with A&M holding a 9-1 advantage in the series. The Aggies have won the last two games since ISU’s lone win in the series in 2005 (ISU 42, A&M 14 in College Station). A win over ISU would give Aggies ninth win in last 10 Big 12 contests, which would be the most successful run against Big 12 opponents ever. The Aggies went 8-1 vs. Big 12 in 1998 (7-1 regular season, plus title game). Quarterback Ryan Tannehill is 258 yards from becoming the 13th Aggie to hit the 4,000-yard plateau in career total offense in just his 12th game as a starter at quarterback. Place kicker Randy Bullock is 15 points from becoming A&M’s fourth 300-point scorer, and five FGs from becoming fourth place kickers with 50 three-pointers. Cornerback Terrence Frederick is one pass broken up from matching Wrecking Crew founder Chet Brooks and Donovan Greer at No. 9 on career PBUs list with 26. Wide receiver Ryan Swope is 40 yards from 2,000 yards in career all-purpose while Jeff Fuller is five catches away from 200 career receptions. Running back Cyrus Gray is just 228 all-purpose yards away from the 6,000-yard plateau. A&M’s next fumble recovery will be their first since the 2010 Texas game, a span of seven games, 29 quarters and 640 opponent chances. The Aggies were credited with a fumble recovery when OSU running back Justin Blackmon inexplicably dropped the ball and it rolled through the endzone. HOUSTON, TEXAS (October 10, 2011) Wings Over Houston Airshow honored “Tora, Tora, Tora” as the recipient of the 2011 Lloyd P. Nolen Lifetime Achievement in Aviation Award, which recognizes individuals, organizations, companies and corporations dedicated to the promotion or advancement of aviation. As one of the most dramatic and visual acts in the air show industry, “Tora, Tora, Tora” performs twelve to sixteen airshows a year in the United States and Canada with its re-creation of the 1941 attack on Pearl Harbor. “Tora, Tora, Tora” began nearly 40 years ago when six replica Japanese aircraft were donated to the Commemorative Air Force. The Gulf Coast Wing requested assignment of the aircraft and began developing an act for presentation at air shows, which debuted at the Galveston Air Show on June 25, 1972. A living history lesson, Tora’s re-creation provides breathtaking smoke, fire and explosions from the pyrotechnics team as a professional announcer explains the purpose, history and performance to the crowd. With the motto “Lest We Forget,” the Tora group flies with the intention to help individuals throughout the world understand that war does not discriminate in the pain it causes. "Wings Over Houston is thrilled to honor Tora, Tora, Tora for their dedication and achievement in the aviation industry. The Tora team sets themselves apart with their strong sense of spirit and camaraderie. We are proud they call Houston home." The Wings Over Houston Airshow will he held at Ellington Field on October 15-16, 2011. HOUSTON, TEXAS (October 9, 20110 The USA Softball Women’s National team doubleheader against Texas A&M University has been cancelled today due to rain and weather in the area. The games have been rescheduled for a doubleheader tomorrow at the Aggie Softball Complex in College Station. Game one is slated for a 5 p.m. first pitch. Game two will follow immediately. Admission to both games will be free to the public. Both teams will be available for autographs after the games. USA Softball will return to Cougar Softball Stadium in Houston on Tuesday evening at 7 p.m. for a match up against the University of Houston. Tickets from today’s cancelled games can be redeemed at the gate on Tuesday evening for admission. Both teams will be available for autographs after the game. HOUSTON, TEXAS (October 1, 2011) In a match that saw the Houston Dynamo and the Chicago Fire head to the locker room at halftime tied at 1-1, the fans at Robertson Stadium saw no second half scoring and that’s how it ended; Dymano-1, Fire-1. Houston is now 10-9-13 (43 points) on the season while Chicago moves to 10-9-13,with 37 points. The Dynamo got on the board first in the 33rd minute when midfielder Colin Clark sent home a loose ball that deflected off Fire defender Jalil Anibaba and landed in the front of the net. The goal was Clark’s fourth of the season, bringing his MLB career total to 13. The Fire got even in the 43rd minute, when forward Dominic Oduro sent the ball home with a right foot strike. Midfielder Baggio Husidic was credited with the assist. The score gave Oduro his 12th of the season and 26th of his MLS career. The Dynamo had 13 shots, with six of them on goal, while Chicago had eight shots with five on goal. Dynamo goalkeeper Tally Hall recorded four saves while is counterpart for the Fire, Sean Johnson, tallied five. The Dynamo will next face Portland on Friday October 14 on the road. They return the Houston for their final regular home game of the season against the Los Angeles Galaxy on Saturday, October 23.